Live from now until August 22. Bundle Stars has launched its biggest ever sale which is live right now until August 22. 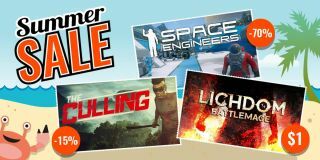 With timed deals and sale-length discounts alike, the Summer Sale includes a mix of contemporary hits and old classics—offering discounts on certain games (via Steam keys) at 90 percent and more. The F.E.A.R. bundle includes the original game, Fear 2, Fear 2: Reborn, and Fear 3 with 90 percent off, meaning you can snag all four games for £3.26/$4.99. Rocket League 4 Pack is also going at minus 47 percent for £31.49/$41.99, while Space Engineers is £5.69/$7.49 until 10am BST/2am PT August 12. Buying anything from the sale grants you automatic entry to Bundle Stars’ HTC Vive prize draw—information on which is detailed post-purchase. The Bundle Stars Summer Sale runs from now until August 22. Browse the full list of bargains at your leisure by heading this-a-way.